YOU’VE heard of lab-on-a-chip, the incorporation of microfluidic circuitry into a sliver of silicon or plastic that promises to do to chemistry what transistors and integrated circuits did for electronics. At the other end of the scale we now have lab-on-a-truck – a 15m-long, 20-tonne behemoth that will tour the USA and Canada this spring to demonstrate the latest in liquid chromatography / mass spectrometry (LC/MS/MS) instruments. 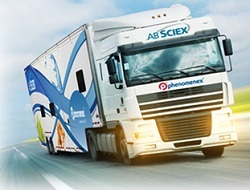 Put together by AB Sciex and Phenomenex, the truck will make a multi-city tour starting from Pittcon 2012 in Orlando, Florida, and ending in Vancouver, Canada, in May. On the way it will criss-cross the North American continent taking in Texas, California, New England, the Midwest, and finally the Pacific Northwest. The companies say this so-called ‘mass-tastic’ voyage will demonstrate the power of their newest analytical instruments in testing for food safety, clinical research, environmental analysis, forensic investigations, small molecule analysis, and peptide quantitation. The state-of-the-art lab on board includes a rapid response unit, including the same technology used already this year when concerns about contamination of orange juice with Carbendazim, a fungicide, were raised in the USA. In the Solutions Bar on board, visitors will be able to ask detailed technical questions of the AB Sciex/Phenomenex rapid response unit experts on board. Some of these will be used in a video blog that will run throughout the tour. The Mass-tastic Voyage starts on 12 March 2012 in Orlando, and visits Atlanta, Boston, Chicago, Dallas, Denver, Houston, Kansas City, Los Angeles, Minneapolis, Montreal, New Orleans, New York, Philadelphia, Phoenix, Raleigh, San Francisco, Seattle, Vancouver, and Washington DC, among others, ending on 20 May 2012.